This month Penal Reform International will be participating in the Human Dimension Implementation Meeting, organised by the OSCE Office for Democratic Institutions and Human Rights (OSCE/ODIHR). The Human Dimension Implementation Meeting is Europe’s largest annual human rights conference, and will take place on 10 to 21 September 2018 in Warsaw. The meeting provides participating States, the OSCE Partners for Co-operation, OSCE structures, civil society, international organisations and other relevant actors to examine the progress of the implementation of OSCE human dimension commitments, discuss associated challenges, share good practice and make further recommendations. PRI’s delegation will be hosting a side event on the Nelson Mandela Rules and co-sponsoring the Women’s Power Breakfast, where PRI will be speaking about gender in corrections. Women in the justice system: Wednesday 19 September 2018, 8.15–9.45am, Opera meeting room. This breakfast session will look at women’s representation in the justice system and the impact of this on justice outcomes. Azamat Shambilov, PRI’s Regional Director in Central Asia, will discuss gender-sensitive prison management. Download the flyer here. Oral statement: PRI delivered an oral statement on the importance of the Nelson Mandela Rules – the revised UN Standard Minimum Rules for the Treatment of Prisoners – for the prevention of torture and ill-treatment. Read the statement here. 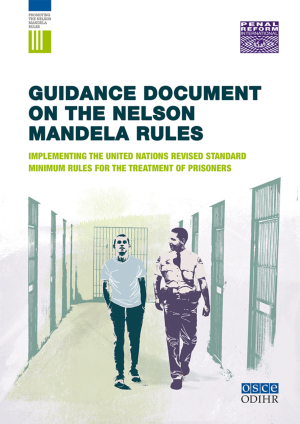 Side event: Implementing the UN Nelson Mandela Rules on the Treatment of Prisoners: new guidance and country experiences: Tuesday 11 September 2018, 8.15–9.45am, Opera meeting room. Download the flyer here. At this side event, PRI and OSCE/ODIHR will launch their new Guidance Document on the Nelson Mandela Rules and present promising practice examples from the OSCE region and beyond. A panel of experts working in prison administration and monitoring will give presentations and there will be an interactive discussion. Breakfast will also be served.